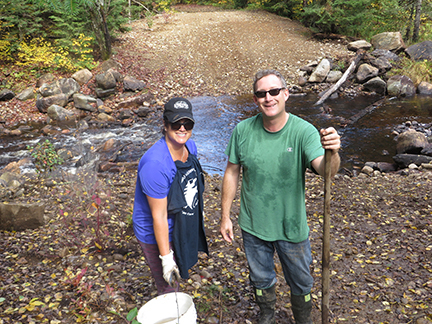 The ADFSF was successful in receiving a Toronto Dominion Bank Friends of the environment grant in the amount of $7,500.00 toward the restoration and rehabilitation of Ten Mile creek just upstream of Goose Lake. We thank the TD Bank Friends and look forward to an ongoing partnership with them and hopefully many other projects in the future. As set out in the grant application, our Foundation will be rehabilitating the banks of the creek that were washed away during the spring floods a couple of years ago. The grant was based on our contribution of in-kind donations of material, equipment and labour. The extent of the project will be to stabilize the banks with both hard and soft materials and employing what is referred to as "green rip rap". The details of the project are being engineered now. Once they are available, we will be submitting an application for a "work permit" because the project area is on Crown Land and under the jurisdiction of the Ministry of Natural Resources and Forests (MNRF). 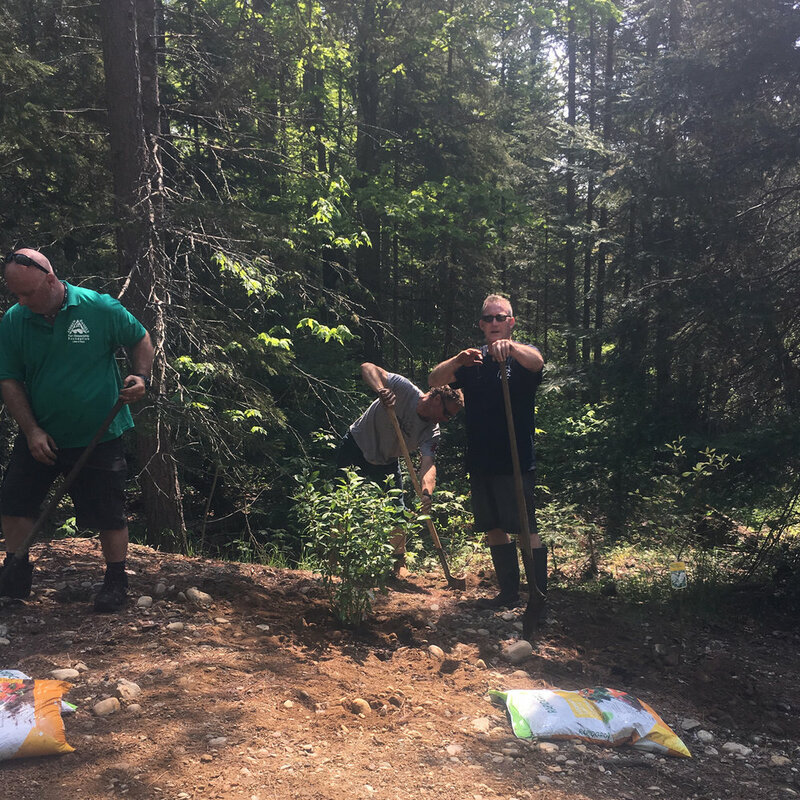 MNRF will be a partner is this project and assist with supervision, education, promotion and selecting appropriate materials to restore the habitat. Education and promotion are a large part of the project as well. It is an opportunity to demonstrate the damage that nature can cause herself and how we can help remedy the damage and enhance the natural environment specifically as it includes in our mandate, fish and fish habitat. Visit our website for further details including dates and times and how you can participate. Over the past seven or eight years this has been one of our signature projects. George Lupton, an avid angler and former Township road superintendent alerted us to the crash of a large logging truck through the 10 mile Creek bridge. The two large galvanized steel coverts and their supporting concrete were a tangled mess. This abstraction inhibited fish traveling up the stream to spawn. The 10 mile Creek partnership between the township, stakeholders and ourselves started in 2012. The Ministry of Natural Resources and Forestry, after much comes consultation resulted in our obtaining some financial support from the TD Friends of the Environment Foundation. Marie Poirier negotiated a comprehensive drawing of a proposed solution from Duke engineering in Huntsville. This was submitted to MNR in July 2015. Approvals and a permit were issued this August. Our lead contractor B.O.R. Aggregate company promptly did the work on August 28. They cleaned up the concrete and debris and landscaped per the approved drawing and the onsite meetings we had with Steve Scholten MNR’s Management Biologist. 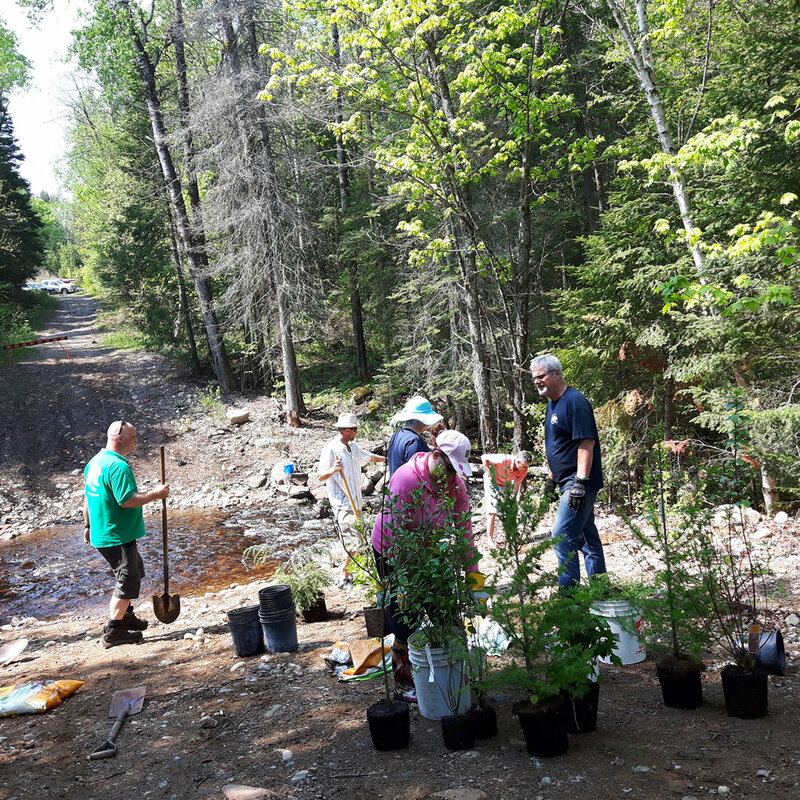 George Daniels, Daphne Curtis, Dennis Rolland, Cathy Nystrom and Andy Montgomery obtaining native plants from Dwight Garden Centre. at 10 Mile Creek showing stabilized creek banks as seen in the background with stream flow visible. 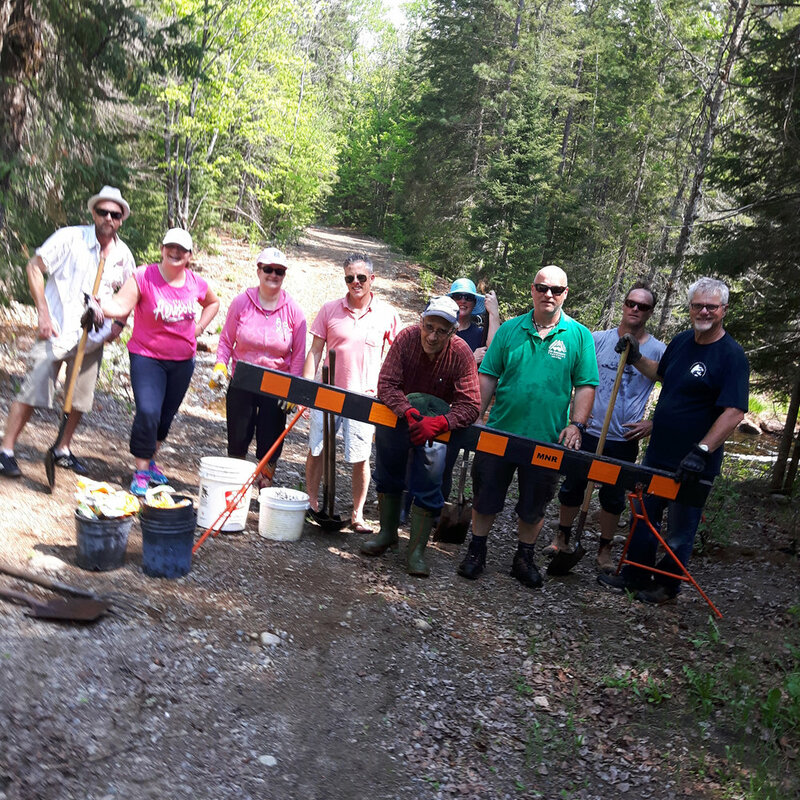 On Sunday, May 27 we had seven foundation member volunteers and three RBC employees take part in the RBC Day of Service. 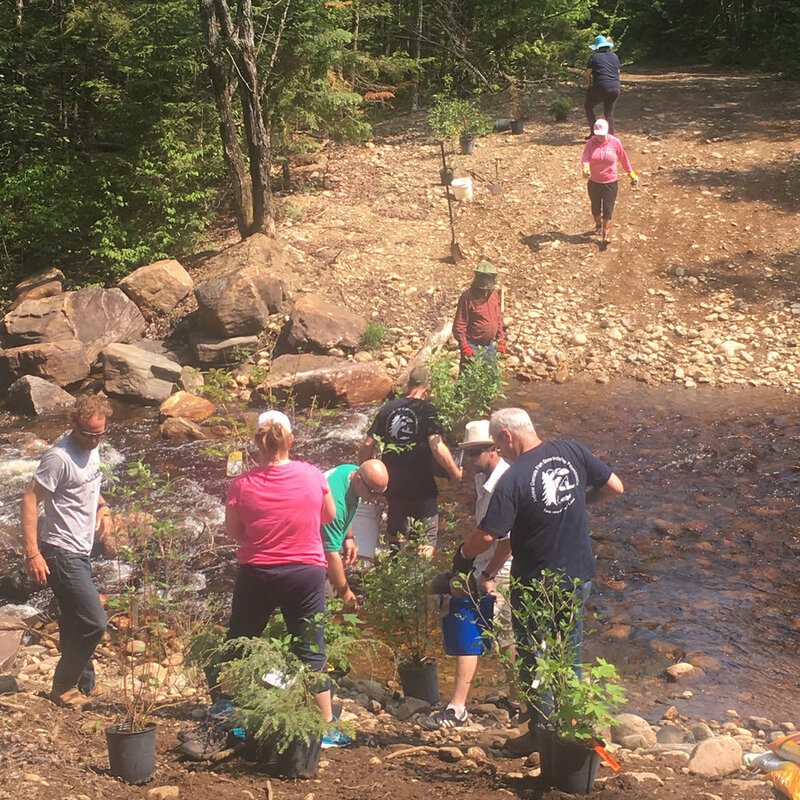 For this day we braved the extreme heat and blackflies and continued our Ten Mile Creek Project by planting local shrubs to avoid shoreline erosion at the site. Native shrubs and planting soil was delivered and sponsored by Dwight Garden Center. Many thanks to the member volunteers, Chris Daniels (President), Ben Boivan (Director), Denis Rolland ( Director), Roddy Samual-Stevens, Scott MacGrenere, Jeff Porter and David Temple. Also many thanks to the RBC volunteers Jennifer Nadrofsky, Cheryl Brush and Glenda Reid. Six years working on this project and it's finally done. Special thanks to our liason Councillor Terry Glover for working with staff and fellow council members for the approval of the sign. Also thank you to Huntsville's RBC branch for their Community Day of Service and grant, Cathy Nystrom and Daphne Curtis who assisted with tree and shrub planting. Missing from the photo are George Daniels, Ben Boivin, MNR Biologist Steve Scholten who were the drivers for the Ten Mile Creek repair work. In photo Secretary/Treasurer - J. Godard, President - C. Daniels and Director D. Rolland.